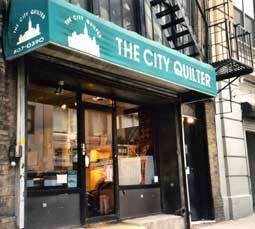 Our shop opened on February 18th, 1997 one block south of our present location. That first store was just 850 square feet, but we somehow managed to fit 1,200 bolts, a classroom and an office in what was a “cozy” environment. We were reborn in October, 2003 when we moved one block North into a space that is more than 3 times larger. A public exhibition highlighting the work of the more than 3,500 students that have taken our classes over the past decade took place from January 15th through March 2, 2008 at the Williams Club, 24 East 39th Street. The 45 juried quilts were seen by more than 1,000 people. The second way that we recognized this milestone was with our 10th City Quilter Challenge, which was dedicated to creating a City Quilter commemorative quilt. 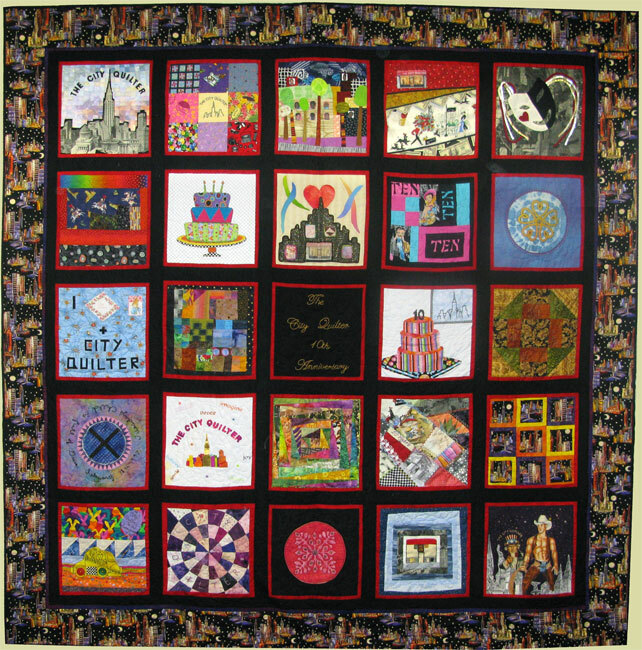 25 City Quilter-themed blocks were made into a 10th Anniversary City Quilter Quilt that can be seen from time-to-time in the shop, and always on this web page.